VKH Live - Jupiter: Listening Party + Live Reaction to "Theory of Evolution" | VKH Press – J-Rock & Visual Kei Coverage Worldwide! Home / Jupiter / Media / Slider / VKH Live / VKH Live - Jupiter: Listening Party + Live Reaction to "Theory of Evolution"
VKH Live - Jupiter: Listening Party + Live Reaction to "Theory of Evolution"
Since Jupiter recently released their first EP with their new vocalist (click here to get filled in if this is news to you), we figured we should all give it a listen ! Join us tonight at 10:30 PM EST/7:30 PM PST for a special "listening party" edition of VKH Live! We're going to be listening through Theory of Evolution together and sharing our reactions to the new music, so this stream will be a live reaction to the album! 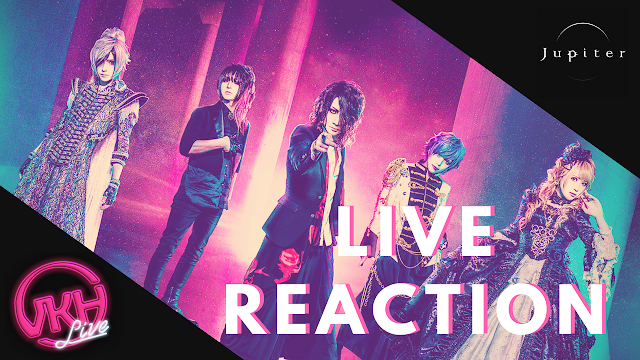 Afterwards, we'll talk about our impressions of the album, so make sure to join the live chat and leave your thoughts! Due to copyright laws we cannot play the EP itself on the stream, so we will be listening to it offline privately while streaming our reaction. We will be pausing briefly in between each track to react and help keep in sync with everyone watching. You will want to have your copy of Theory of Evolution for the reaction part of this stream, so if you don't have it already, we've embedded Apple Music and Spotify widgets for the EP below! Once you've got the music, scroll on to check out the stream!